"Just What is a Live Event?" Teleseminars - These are hosted by phone, so you don't have to prepare slides or get on camera. All you have to do is talk. Super easy! Webinars - This type of event generally involves either a PowerPoint presentation or a screensharing demonstration of some kind. You can also use your web cam to demonstrate offline techniques such as crafting or cooking. Telesummits - These are large events involving many different speakers, and are typically done via the phone, like a teleseminar. Meet-ups - Small, in-person events centered around a topic of interest, such as blogging, WordPress, photography, or other subjects. Conferences - Multi-speaker events generally held in a hotel or conference center. So you see, a "live event" can run the gamut from a small, informal affair to a large gathering that can take many months to plan and prepare for. Of course, you don't have to start at the top. In fact, I recommend starting small with a free event just to get your feet wet. "My Nonprofit Isn't Suited to a Fundraising Live Event"
Really? You might be surprised at the very different audiences that love to attend events of all kinds. The truth is, EVERY nonprofit and audience can benefit from live events - even yours! "I'm Way Too Shy to Host an Event!" A lot of people think that, but it couldn't be further from the truth! The fact is, you don't have to be an outgoing people person to run a live event. That's what co-hosts and guest speakers are for. All YOU have to do is have a plan to bring them together. And for many introverts, the ability to "hide" behind a PowerPoint presentation or speak as a part of a larger group is just what they need to get out there and take advantage of this powerful tool. So don't let your feelings of shyness hold you back, when hosting a live event might just be the breakthrough you need to grow your business! But before you can do that, you have to know where to start. Successful Nonprofits to Plan and Host Live Events! This is where you'll lay the foundation for your wildly successful event, because if you don't plan ahead, you'll have more stress, spend more money, and wind up feeling like a failure rather than the superstar you are! The 4-step plan all successful events follow - Miss even one of these, and your event will not be the polished, professional, and profitable experience you're hoping for! How to ensure your event has its own unique identity - Because the last thing you want is to be seen as just another "me too" in your market. How to dig deep and really uncover what makes your event shine - Just as your business needs a "Unique Selling Proposition" to set it apart from the competition, so does your event. 3 questions to ask when thinking about your target audience - If you can't thoughtfully answer these, it might be time to go back to the drawing board. 5 ways to get creative and storyboard your event - Don't skip this exercise! It will help you clearly see what's working with your event - and what's NOT! 30+ expenses you must consider - If there's one thing that can kill a perfectly planned event, it's an unexpected cost overrun. Don't let that happen to you! A simple 3-step timeline plan - This will help you see the big picture and keep everything moving along smoothly. Knowing which tools you really need - Because there's no room for shiny object syndrome in event planning, and the last thing you want is to waste time learning new software that isn't necessary! Three common pitfalls of event planning - And the one tool that can help you avoid them. 2 top online services to help promote your event - And why you might choose one over the other. Where to find WordPress themes made specifically for event announcements - Don't try to re-invent the wheel when you can buy a ready-made solution for less than $20! An all-in-one planning app that's a must have for busy event organizers - It manages your contacts, produces reports, tracks your budget and more. The best FREE QR code generator - Use it to produce eye-catching QR codes for business cards, stationery, postcards or any other printed material you're using. The number one tool for finding out exactly what your market wants and needs - And it's free to use! The top shareable calendar - use it to keep everyone on task, plan your timeline, and make sure you don't overbook! The "must read" blog you aren't reading - Just for event planners, this site will keep you up to date on the latest trends and tools when it comes to planning live events. 4 things to consider before hiring outside help - And if you have a bit of control freak in you, these might hurt! 6 areas you may want to ask for help in - The key here is to know your own strengths, and hand off that which is not your favorite thing to do. 3 factors that determine the success (or failure) of contractors - Skip this section and you're risking more than just added frustration! 2 top benefits - and one huge drawback - to relying on volunteers - Make sure you know the true price of free labor. 8 things that motivate volunteers to do great work - Be sure to leverage these to your benefit! How to create a culture of clear, concise communication - Because nothing will derail your event faster than misinterpreted instructions or a misread email. 5 must have welcome package inserts - Miss any of these, and you'll leave your staff feeling confused...or worse. How to run a successful team meeting - And how to ensure everyone is on the same page, all the time. 6 steps to a great employee interview - Because finding just the right person starts with asking the right questions. Live events are here to stay. Business owners love them for their listbuilding and profit-pulling capabilities, and your audience loves them for their sense of community and handholding. So right now, while you're planning your next event, is the time to ensure all your events can stand the test of time and grow with you. 3 trends you must be aware of - Miss this and you may just miss the mark with your target audience! The biggest shift in live events to happen in years - Plus, what it means for you, your team, and your audience. The 2 factors that will have the greatest impression on your audience - Get these right, and you'll easily build a rabid fan base who will attend your events again and again. How to ensure your speakers are happy - Because happy speakers promote your event to their audience, and will willingly return. The ONE thing you must do after your event - And most everyone forgets! How to sincerely thank both your guests and speakers - It's just one more way to ensure happy attendees and speakers! Your Next Wildly Successful Live Event Starts NOW! In this four-module course with both video and a printed workbook so you can follow along as we work through everything you need to know. By the end of this training, you'll have the confidence and tools to plan and pull off an event of any size. So what are you waiting for? Grab your copy today, and start planning your live event tomorrow! Make no mistake - live events are quite simply the hottest way to grow your nonprofit, build your mailing list, and expand your mission's reach. If you're not hosting them yet, you will be before the year is out - or you'll find yourself left behind. So take the steps you need today to get started on the right foot. The cost of this product is only $17 and you get access to it instantly. And since it's available on-demand, you can purchase it and get instant access to it right now, FOR ONLY $17! As soon as you click the buy now button on this page, and fill out some simple details, you'll get a special link sent directly to your email inbox with all the details on how to get instant access to the "Event Planning & Management Master Class", FOR $17! There are some products out there that offer you a fantastic deal, but then try to commit you to a monthly recurring fee every month. This is most definitely NOT one of them. We're literally giving you this entire product, FOR ONLY $17, as a means of "putting our best foot forward" and demonstrating real over-the-top value. Our hope is that you'll love it and this will be the start of a good business relationship for years to come. 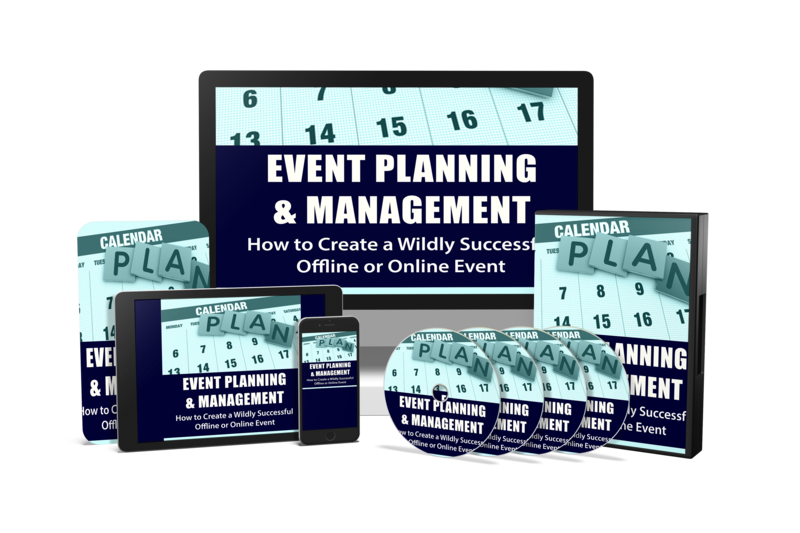 You're getting instant access to the “Event Management & Planning Master Class”... FOR ONLY $17! In this training, we'll be walking you through exactly how to host and plan a successful fundraising event, without the normal struggles! We'll show you the EXACT path you should follow to build your own successful fundraising events month after month to help your nonprofit explode! And we're only charging $17 for this. This Is Truly A Limited Time Product So Click The Button Below And Get INSTANT ACCESS! P.S. Don't forget - this is a four-part video course with printable workbooks so you can easily follow along and take notes. Nothing is left to chance, and all the secret event planning strategies of the pros are revealed inside, so grab your copy now and make your next event as spectacular as you know it can be!